We’ve been enjoying a lot of elderflower liquor in 2010. For Cara’s birthday, Kate brought over the chic-est disposable cocktail glasses she could find, and made individual Parisians for her bistro-themed buffet. In return for hosting said event, Cara gave me a large bottle of St-Germain to say thank you. Since I don’t usually splurge on fancy liquor for my own parties, and rely on generous friends like Kate to contribute, I rarely experiment with cocktail concoctions and various food pairings. But now that I am up to my ears in Elderflower liquor, that’s all changed. This cocktail is a riff on St-Germain’s signature combination, and is one of those drinks that goes down easy, and makes any occasion feel all the more festive. The elderflower is wonderfully fragrant, and the hint of lemon makes it pair well with any citrus dessert. Try serving it with lemon squares, or check out our article on Southern Flourish for their perfect cookie pairing. More importantly, for this New Year’s Eve, if you can’t afford magnums of champagne, this flute of fizz instead is an excellent alternative. Caution: this cocktail may cause you to make-out with a stranger at midnight. Add two or three cubes of ice to a cocktail glass. 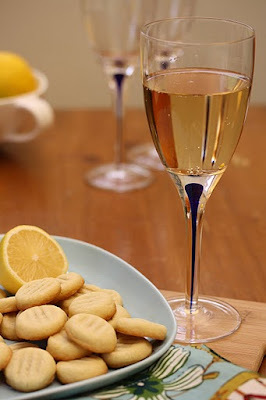 Pour in 1/3 cup Prosecco, followed by ¼ cup elderflower liquor, and 1/3 cup of sparkling water. Place a lemon round in the glass and serve. Repeat with remaining glasses. Mmmmm, looks delicious! I love the sound of this cocktail. I like the glasses – short and fat Almost a cross between a modern flute and 50’s champagne goblet.